3Departamento de Pediatria do Hospital de Santa Maria. Copyright © 2013 Teresa Santos et al. This is an open access article distributed under the Creative Commons Attribution License, which permits unrestricted use, distribution, and reproduction in any medium, provided the original work is properly cited. Background: Adolescence includes a period (10 to 19 years) of profound biopsychosocial changes, constituting potentially difficult challenges, which may become more pronounced in the presence of a chronic condition and its limitations. Responses are not homogeneous and can be quite variable, depending on various specific individual factors. Research comparing adolescents with or without chronic illness, or comparing across different conditions, has been contradictory, not confirming a direct relationship between the degree of suffering and the chronic condition. Objective: To characterize and assess the impact of 1) having a chronic condition (CC) and 2) how CC affects school participation; and its association with life satisfaction and perception of wellness, controlling for demographic factors: age, gender and family socioeconomic status (SES). Methods: 5050 Portuguese adolescents with an average age of 14 years participated in the Health Behaviour in School-aged Children/WHO (HBSC). Results: The majority of the adolescents with CC reported that their conditions did not affect school participation. Adolescents with CC who indicated that CC affected school participation felt more frequently unwell and presented lower life satisfaction. Being a boy, younger and having high family socio economic status (SES) were identified as predictors of higher life satisfaction; on the other hand, being a girl, older, having lower SES, living with CC and feeling that CC affects school participation are predictors for feeling more frequently unwell. Conclusions: These adolescents showed an increased vulnerability, presenting internalized symptoms and lower life satisfaction. Furthermore, when there was simultaneous occurrence of living with CC and that CC affected school participation, the impact was even higher. Thus, it is crucial that future interventions should include the identified predictors, combined with “listen to the voice” of adolescents, throughout the adaptation process. Infant mortality rates are rapidly declining, while the prevalence of childhood chronic conditions (CC) arises, bringing up significant hurdles . Chronic condition refers to any extended/irreversible illness, and asthma, congenital heart disease, epilepsy and diabetes which are most prevalent in adolescence . Living as well as managing any chronic condition and its limitation during adolescence (the period from 10 - 19 years old, where profound biopsycho-social changes occur) constitutes a major challenge for the individual, his/her family and healthcare professionals [3-5]. Advances in medicine made it possible to prolong and enhance the lives of children and adolescents with chronic conditions, however, adolescents were still affected in their general development  and faced numerous challenges, including more limitations in everyday life participation , more difficulties achieving cognitive skills, family/school/peers relationships, health-related behaviors, health perception , developmental milestones, and adhering to daily treatments and transitioning to adult care. So, adolescents with a chronic condition can be at higher risk for a healthy emotional and behavioural psychological development [8,9], and can experience more adjustment difficulties [10,11], as well as internalizing symptoms, such as depression [12,13], anxiety and social withdrawal, and externalizing others related to behaviors . These adolescents are therefore doubly disadvantaged and may engage in risky behaviours in a similar rate as healthy peers, and be more vulnerable to adverse health outcomes [15,16]. Researches comparing adolescents with and without chronic condition, or comparing across different conditions have been contradictory, inconclusive, and not confirming a direct relationship between the degree of suffering and the condition . Some studies suggest increased risk in chronic population , and others suggest the possibility of successful adaptation . Responses are quite variable and not homogeneous, depending on various specific individual/contextual factors, and also on the type of condition and emerging limitations, being even worse in the presence of both . Also, the prevalence of different health conditions, namely having a greater number of health problems (3/more compared with 2) is concurrently associated with worse quality of life , as well as the type of chronic condition. These results are shown, both in Western and Asian populations [20,21]. Moreover, the effects of a chronic condition extend beyond the individual to the entire family system  and scholar context, namely through frequent absences, decline of academic performance, poor self-perceptions of academic competence and difficulties to cope with classroom demands . Growing up with a chronic condition may contribute to worse health related-quality of life and symptoms of anxiety and depression in young adults , placing them at a higher risk for poor educational, vocational and social outcomes . Nevertheless, the individual perception-related disease as well as the adaptation to a chronic condition is a dynamic and changeable process, and it can be moderated by child’s age, gender, corresponding socio-cognitive developmental level , real perception, exposure to cultural/ familiar beliefs  and construction of concepts of health and illness . Thus, interpretation, comprehension and meanings associated with the impact of chronic condition are strongly affected by culture and socialization process, and influence its integration in the adolescent life’s context . Meanings concerning the disease start to consolidate in scholar ages, and, if chronic conditions do not affect participation in school/leisure activities, and, family/school are able to provide appropriate support without excessive anxiety, there are good chances for a good adaptation. Having an older age at the disease’s onset or longer disease duration has higher risks for adjustment difficulties . Boys seem to be significantly more likely than girls to display behavioral and adjustment problems , and girls show higher levels of anxiety , depression (in insulin-dependent diabetes’s adolescents) , emotional distress (sadness, expressing depressive symptomatology) and suicide ideation . In general population, it’s consistent with previous research, e.g. high anxiety/depression in adolescence is associated with poorer health  and girls report poorer health outcomes and are at great risk for poor self-rated health, low life satisfaction and multiple health complaints [35,36]. It’s also showing higher dissatisfaction with their body image, which specifically affects their self-esteem, life satisfaction and mental health . This may be explained by different internalization and externalization patterns, but gender-specific experiences of puberty may also play a role . Thus, gender differences in almost all countries and regions become more pronounced with age and with older girls being systematically worst off . In addition, cross-cultural data also suggest that life satisfaction/better health is associated with financial satisfaction , socioeconomic status and education which are strongly associated with several chronic conditions , influencing, directly and indirectly, health status and self-perceived health [42-44]. In almost all 22 European countries, groups of lower socioeconomic status have shown higher rates of death, poorer health selfassessments [36,45], prevalence of subjective health problems and lower health [46,47]. Adolescent’s selfrated health, reported mental health and quality of life also decline significantly, especially in low/middle-income families [48,49], and mental and physical childhood health outcomes have persistent effects on lifetime health and socioeconomic status outcomes . In conclusion, it can be seen that older pupils, girls, students with low socio-economic status, or frequent health complaints reported decreased mental health  and health related quality of life . In Portugal, the studies Health Behaviour School-Aged Children (HBSC)  and Kidscreen  have shown the same tendencies reported in literature (poorer health and life satisfaction in girls and older adolescents), pointing out higher vulnerability in this population. It seems, therefore, relevant to develop the following work with the aim of characterize and assess the impact of: 1) having a chronic condition (CC), and 2) how the chronic condition affects school participation; and its association with life satisfaction  and perception of wellness (item “Feeling so sad that it seems that I can’t take it”) , controlling for demographic factors: age, gender and family socioeconomic status (SES) (FAS: Family Affluence Scale) . It is hypothesized that adolescents living with a CC and feeling that CC affects school participation have greater impairment in their life satisfaction and perception of wellness. The total sample refers to data from the HBSC 2010 study—Portuguese Survey  (www.hbsc.org) and consisted of 5050 Portuguese adolescents (52.3% girls), with a mean age of 14 years old (SD = 1.85), attending the 6th, 8th and 10th grades, randomly selected from 256 classes and 125 national public schools. The majority of the children and adolescents have Portuguese nationality (94.4%). 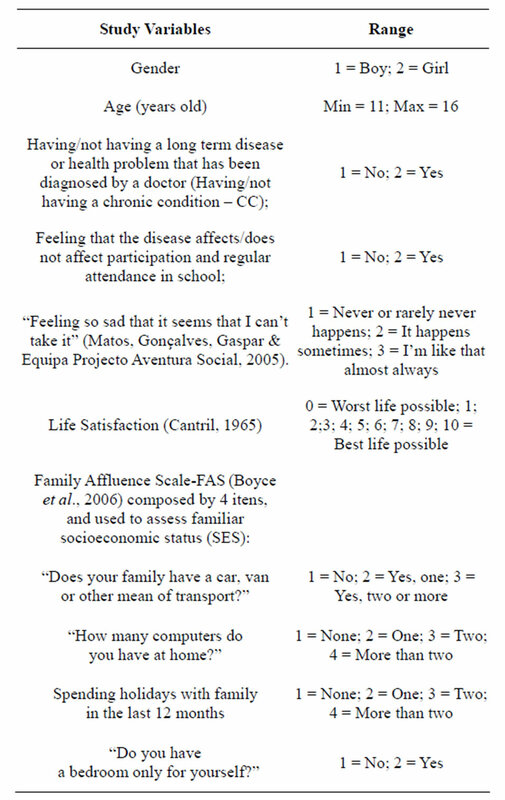 A self-administered questionnaire from the Portuguese sample of the HBSC was used. Portugal was included for the first time in 1996, in 1998 as a full partner, and, since then, the study is carried on every 4 years . HBSC is a school-based, self-report questionnaire developed cooperatively between international researchers according to protocol, and used in collaboration with World Health Organization. It is essentially a descriptive and crosssectional correlational in nature, that pretend to assess children and adolescents mental and physical health . The aim of the study is to understand health behaviours and well-being among adolescents, within their social context . Especially designed to be appropriate for adolescents, ageing 11 - 15, this survey consists of items measuring background factors (e.g., socioeconomic status, family structure), individual and social resources (e.g., body image, school environment), health behaviours (e.g., smoking, dieting, sexual behaviour, violence), and health outcomes (e.g., life satisfaction, psychological well-being, and self-reported health). For the purpose of the present work a set of variables were selected that are described in Table 1 (see Measures). Table 1. Variables included in the study. Regional Offices of Education, and it was approved by the scientific committee, national ethics committee and national data protection. All participating schools made available informed parental consent, required by the committee of parents from each school. Questionnaires were sent to schools and, according to the protocol, teachers administered the questionnaires in the classroom, with voluntary’s student participation. Confidentiality was ensured with anonymous response to the questionnaire and restricted access to HBSC research team members, regarding the work on computing and data analysis. The response rate was of 90% regarding schools. No pupil’s refusal was identified. For the purpose of this study, the group of students with chronic condition was defined by an affirmative answer to the question: “Do you have any long term disease or health problem that has been diagnosed by a doctor?” Then, in a second step it was inquired the extent to which having a chronic condition affects or not affects school participation. Variables included in the study are described in Table 1. Questionnaire’ data were scanned, translated and interpreted by the program-Eyes & Hands-Forms, version 5. Data was entered for statistical analysis, into the database of the Statistical Package for Social Sciences (SPSS), version 19.0 for Windows. Then, descriptive analysis, ANOVA, Qui-square tests and Multiple Linear Regressions were used to determine the relationship, and to examine the strength of the associations between the analysed variables. The majority of the children and adolescents do not have a chronic condition (CC) (81%; N = 3763), and the group who has (19%; N = 884), reports mainly chronic diseases (88.2%), followed by sensorial (5.2%), motor (4,4%) and cognitive/psychological (2.2%) conditions. Teens that indicate to have a chronic health condition mostly report that the condition does not affect their regular participation in school (85.7%; N = 1180). ANOVA and Qui-Square tests were used to better understand specific differences or associations, between the study variables and 1) having/not having a chronic condition (CC), and, 2) how that chronic condition affects/ not affects participation and regular participation in school, in respect to a set of other dependent variables, controlling for demographic variables: gender, age and familiar socioeconomic status (FAS/SES). “Having/not having a chronic condition” (Table 2) was not significantly associated with gender nor age. Data showed a significantly different distribution according to “Feeling so sad that it seems that I can’t take it” [χ²(4, N = 4554) = 24.39, p ≤ 0.001]. Adolescents with chronic condition feel more frequently “like that almost always” (5.2%), compared with adolescents without chronic condition (3.5%). “Having a chronic condition” and feeling that “CC affects/not affects regular participation and regular attendance in school” (Table 3), were not significantly associated with gender or age. However, a significant association was found regarding “Feeling so sad that it seems that I can’t take it” [χ²(2, N = 1335) = 6.80, p ≤ 0.05]: adolescents with a CC, who feel that the condition affects school, feel more frequently “like that almost always” (8.9%), than adolescents who felt that the condition doesn’t affect school (4.1%). Table 2. Bivariate analysis (χ²) of study variables and having/not having a chronic condition (CC), and CC affecting/not affecting school participation. ***p ≤ 0.001; **p ≤ 0.01; *p ≤ 0.05. Table 3. 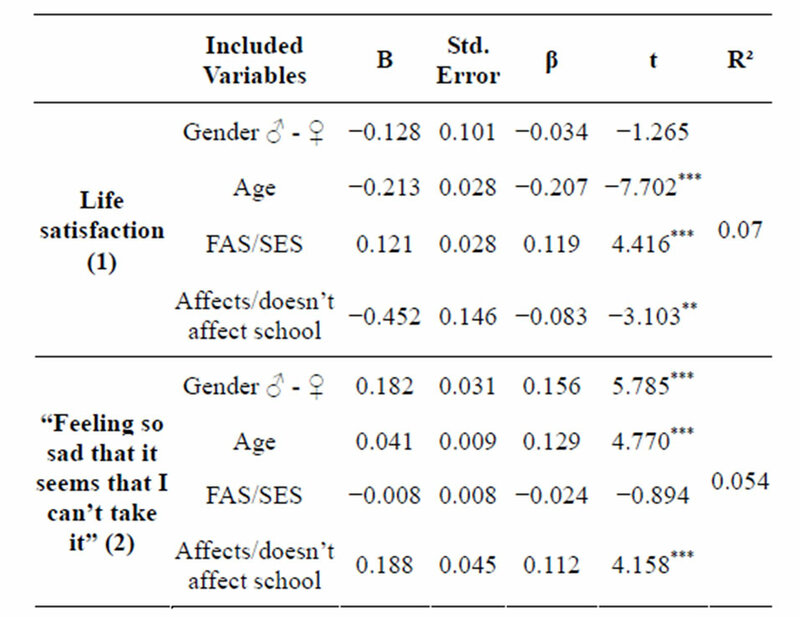 Adolescents’ life satisfaction and Family Affluence Scale-FAS/SES: comparisons having/not having CC, and feeling that CC affects/does not affect school participation (ANOVA). isfaction [F(1,1340; 12.23, p ≤ 0.001)] (M = 7.51, SD = 1.84). Socioeconomic status (FAS/SES) showed no significant difference regarding having/not having a CC. Nevertheless, the group who has a CC and feels that CC doesn’t affect participation in school, has a higher FAS/ SES [F(1,1331; 5.27, p ≤ 0.05)] (M = 5.86, SD = 1.86). 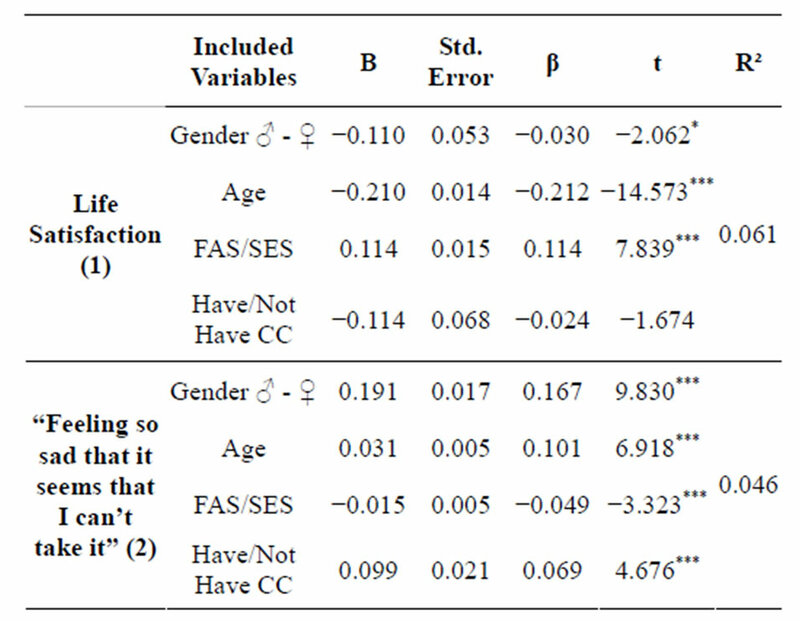 A set of multiple linear regression models was carried out to estimate the relationship between: 1) adolescents’ life satisfaction and 2) adolescent’s wellness (“Feeling so sad that it seems that I can’t take it”), using as predictors gender, age, socioeconomic status (FAS/SES) and the CC “status”: having/not having a chronic condition (Table 4), or feeling that CC affects/not affects participation and regular attendance in school (Table 5). An adjusted model was achieved for the perception of well-being (life satisfaction) [F(4) = 72.953, p ≤ 0.05] and the variance explained by the final model was 6.1%. All predictors, except having/not having a CC, were significantly associated with life satisfaction: boys, younger adolescents, and those who have higher FAS/SES tend to perceive their life as more satisfying. Table 4. Predicting 1) Adolescents’ life satisfaction and 2) “Feeling so sad that it seems that I can’t take it”, using as predictors gender, age, Family Affluence scale-FAS/SES and having/not having CC (Multiple linear regression models). Note: B (unstandardized coefficient) and SE (standard error); β: standardized coefficients. 1) F = 72.953; 2) F = 54.473; ***p ≤ 0.001; **p ≤ 0.01; *p ≤ 0.05. Table 5. Predicting 1) Adolescents’ life satisfaction and 2) “Feeling so sad that it seems that I can’t take it”, using as predictors gender, age, Family Affluence scale-FAS/SES and having/not having CC (Multiple linear regression models). Note: B (unstandardized coefficient) and SE (standard error); β: standardized coefficients. 1) F = 25.275; 2) F = 19.752; ***p ≤ 0.001; **p ≤ 0.01; *p ≤ 0.05.
significantly associated with “Feeling so sad that it seems that I can’t take it”. Girls, older adolescents, those who have lower FAS/SES and a CC, feel more frequently “··· so sad that it seems I can’t take it”. An adjusted model was achieved for life satisfaction [F(4) = 25.275, p ≤ 0.05], and the variance explained by the final model was 7.0%. All predictors, except gender, were significantly associated with life satisfaction. Younger adolescents, those who have higher FAS/SES and feel that CC doesn’t affect school participation, also have better perception of life satisfaction. An adjusted model was also achieved for “Feeling so sad that it seems that I can’t take it” [F(4) = 19.752, p ≤ 0.05], and the variance explained by the final model was 5.4%. All predictors, except SES, were significantly associated with “Feeling so sad that it seems that I can’t take it”. Girls, older adolescents and those who have the perception that CC affects school participation feel more frequently unwell (more frequently report “··· so sad that it seems I can’t take it”). In the present study, we sought to establish a relation between: 1) having a chronic condition (CC), and 2) how that condition affects/doesn’t affect participation in school; and its association with life satisfaction and perception of wellness, controlling for demographic factors: age, gender and family socioeconomic status (FAS/SES), in a sample of Portuguese adolescents. A brief overview of main results shows that the majority of adolescents with a CC mainly report that CC does not affect participation and regular participation in school, in contrast to what is suggested in the literature [23,25]. However, both groups, living with a CC and feeling that CC affects school participation, present higher rates for feeling more frequently “··· so sad that it seems that I can’t take it”. Adolescents, with CC and the feeling that it doesn’t affect school participation, present higher FAS/ SES and life satisfaction. Also adolescents with CC feel more frequently unwell (“··· so sad that it seems I can’t take it”), and adolescents with CC and feeling that CC affects school participation present the same results. Thus, feeling more frequently unwell and presenting lower life satisfaction are important factors that can compromise psychological health and adjustment. These data support the hypothesis suggested in this study and evidenced in the literature, proposing that adolescents living with a CC can have increased vulnerability in general development, presenting lower life satisfaction and internalized depressed symptoms [8,10,13,24], being also consistent with previous research concerning Portuguese studies [53,54]. It is also demonstrated that responses to CC can be worse when 2 limitations occur (having CC and feeling that it affects school participation) . Therefore, chronic condition can be considered as a predictor for feeling more frequently “··· so sad that it seems I can’t take it”. This study also supports previous research concerning the idea that the individual perception-related disease and the adaptation to a chronic condition is a dynamic and changeable process, moderated by gender, age, corresponding developmental levels [26-28] and socioeconomic status [36,40,41]. Data concerning CC report that boys, younger adolescents and having higher FAS/SES are predictors for perceiving life as more satisfying. On the other hand, being a girl, older, having lower SES and a CC are predictors for feeling more frequently “··· so sad that it seems I can’t take it”. Concerning CC affecting school participation, being younger, having higher SES and feeling that CC doesn’t affect school participation are also predictors for more life satisfaction. By contrast, being a girl, older and feeling that CC affects school participation are predictors for feeling more frequently unwell (more frequently “··· so sad that it seems I can’t take it”). Therefore, it is shown that older children [27,39] and girls [32,35,36] can be at a higher risk for a more compromised psychological adjustment, and this might be due to different internalization and externalization patterns . Also, it is presented that a lower FAS/SES is associated with poorer life satisfaction, psychological health and quality of life, as reported in the literature [45,46, 48,49], as well as the results from previous Portuguese studies [53,54]. Thus, in terms of public health and health psychology, health related quality of life needs to be monitored in children and adolescents with and without CC, and with diverse individual, social and cultural differences . It becomes crucial to have better understanding concerning previous important vulnerable predictors, as well as measures to promote health, wellness and disease prevention, resulting in valid information, that hopefully can help to plan more preventive or suitable effective intervention programs [2,4]. However, literature has already given some evidences (supported in this study), namely: 1) adaptation responses to chronic condition in adolescents are quite variable and not homogeneous, depending on specific individual/contextual factors; and, 2) being a girl, older, and having a lower FAS/SES repeatedly appear as important predictors for “poor” health and life satisfaction. Therefore, it is now time for this information to become fundamental for planning interventions. Beyond these “guiding” predictors, interventions should focus on individual and contextual aspects, where distressed areas are identified, as well as risk and protection factors for each child or adolescent. It also highlighted the importance to promote early interventions, once difficulties increased as children became older and had to deal with “being different” from peers, while, simultaneously, had to fight for autonomy from parents/ adults, integrated a social group and rediscovered their body (being even worse if they were girls and had a lower SES). In addition, literature has given some more improving quality of life’s variables to include in interventions, such as helping adolescents to better accept the limitations imposed by chronic disease and readjusting life goals . In Portugal, HBSC and Kidscreen studies have pointed out the need to strength main support structures (family and school), and alert health and education systems for the global aspects of mental health, scholar and social integration, and prevention of risk behaviors, putting in evidence crucial variables such as family, school and peers, but still, much more work needs to be done. This study has a number of limitations which should be considered when interpreting the results. First, the used variables were developed post hoc from an existing survey. Consequently, some variables only had a small number of items, the only items available in HBSC questionnaire. Second, the findings were entirely based on adolescents’ self-reports (even if this was a widely-used procedure in a national survey design), and biases in perception and reporting cannot be ruled out. Finally, the results were cross-sectional (and not longitudinal), and, therefore, it was more difficult to draw conclusions about the direction of causality between the variables of interest, and, due to the nature of the design, the ideal longitudinal data were not possible. Notwithstanding these limitations, this is one of the first investigations concerning the impact of living with a chronic condition in adolescents in a nationally wide Portuguese representative sample—HBSC (Portuguese Survey). So, it is expected that this study’s results and previous explained predictors for better life satisfaction and wellbeing can give schools, families, health professionals and health institutions important guidelines, while planning interventions focused on adolescents with chronic conditions. Compared with their peers, these adolescents seem to need the same guidance and prevention as any other adolescent , in order to provide appropriate and effective support during the transition for adulthood . In addition, it is also increasingly fundamental to “give voice” to children and young people with chronic conditions, taking into account their specific wishes, desires, needs, knowledge, competences and rights , and, moreover, because they are described as competent interpreters of their “world” . The authors would like to thank “Aventura Social” team members for their work on data collection and management. HBSC/WHO 2010 in Portugal was co-financed by Alto Comissariado da Saúde, Ministério da Saúde (High Commission for Health, Health Ministry) and Coordenação Nacional para a Infecção VIH/SIDA (National Coordination for HIV/AIDS). Barros, L. (2009) Adolescents with chronic disease. In: Matos, M. and Sampaio, D., Eds., Jovens com Saúde. Diálogo com uma geração, Texto Editores, Lisboa, 304- 320. Simões, C., Matos, M.G., Ferreira, M. and Tomé, G. (2010) Risk and resilience in adolescents with special educational needs: Development of a resilience program in adolescence. Psicologia, Saúde & Doenças, 11, 101- 119. Michaud, P.A., Suris, J.C. and Viner, R. (2007) The adolescent with a chronic condition. Epidemiology, developmental issues and health care provision. Department of Child and Adolescent Health and Development, Geneva. Miyazaki, M., Amaral, V., Jr., J. and Grecca, K. (2006) Cap. 3, Asma e depressão em crianças e adolescentes. In: Miyazaki, M., Domingos, N. and Valério, N., Eds., Psicologia da Saúde, Pesquisa e Prátic, THS Arantes Editora, São José do Rio Preto, 47-56. Barros, L., Matos, M.G. and Batista-Foguet, J. (2008). Chronic diseases, Social context and adolescent health: Results of the Portuguese national health behaviour in school-aged children survey. Revista Brasileira de Terapias Cognitivas, 4. Barros, L. (2003) Chronic disease: Conceptualization, evaluation and intervention. In: Psicologia Pediátrica: Perspectiva Desenvolvimentista, 2nd Edition, Climepsi Editores, Manuais Universitários 13, Lisboa, 135-172. Panamonta, N., Prathipanawatr, T. and Panamonta, O. (2012) Factors influencing chronic diabetic complications in type 1 diabetes. The Southeast Asian Journal of Tropical Medicine and Public Health, 43, 1245-1251. Gortmaker, S.L., Walker, D.K., Weitzman, M. and Sobol, A.M. (1990). Chronic conditions, socioeconomic risks, and behavioral problems in children and adolescents. Pediatrics, 85, 267-276. Currie, C., Zanotti, C., Morgan, A., Currie, D., De Looze, M., Roberts, C., Samdal, O., Smith, O. and Barnekow, V. (2012) Social determinants of health and well-being among young people. Health behaviour in school-aged children (HBSC) study: International report from the 2009/2010 survey. WHO Regional Office for Europe, Copenhagen. Borges, A., Matos, M.G. and Diniz, J.A. (2011) Estatuto familiar e auto percepção de saúde nos adolescentes [Familiar status and heath self-perception in adolescents]. Temas em Psicologia, 19, 347-360. Richter, M., Erhart, M., Vereecken, C.A., Zambon, A., Boyce, W. and Nic Gabhainn, S. (2009) The role of behavioural factors in explaining socio-economic differences in adolescent health: A multilevel study in 33 countries. Social Science & Medicine, 69, 396-403. Torsheim, T., Currie, C., Boyce, W., Kalnins, I., Overpeck, M. and Haugland, S. (2004) Material deprivation and self-rated health: A multilevel study of adolescents from 22 European and North American countries. Social Science & Medicine, 59, 1-12. Gaspar, T., Matos, M.G., Ribeiro, J., Leal, I. and Ferreira, A. (2009) Health-Related quality of life in children and adolescents and associated factors. Journal of Cognitive and Behavioral Psychotherapies, 9, 33-48. Gaspar, T. and Matos, M.G. (Coord.) (2008) Qualidade de vida em crianças e adolescentes versão Portuguesa dos instrumentos Kidscreen-52 [Quality of life in children and adolescents—Portuguese version of Kidscreen-52 instrument]. CMDT/FMH/FCT, Lisboa. Matos, M.G., Gonçalves, A., Gaspar, T. and Equipa do Projecto Aventura Social (2005) Aventura social, etnicidade e risco/prevenção primária do VIH em adolescentes de comunidades migrantes [Social adventure, etnicity and risk/primary prevention of HIV in adolescents from migrant communities]. IHMT/UNL, FMU/UTL, HBSC/OMS. Currie, C., Samdal, O., Boyce, W. and Smith, R. (2001) HBSC, a WHO cross national study: Research protocol for the 2001/2002 survey. World Health Organisation, Copenhagen. Serrabulho, M.L., Matos, M.G. and Raposo, J. (2012) Adolescents living with diabetes—In their own words. Diabetes Voice, 57, 19-22. *Declaration of interest: Santos, T. receives a PhD grant from the Portuguese Foundation for Science and Technology (FCT), reference SFRH/BD/82066/2011. None of the authors reported any further financial interests or potential conflicts of interest.